The famine of 1891 and 1892 was one of the most severe agricultural crises to strike Russia during the nineteenth century. In the spring of 1891 a serious drought caused crops to fail along the Volga and in many other grain-producing provinces. The disaster came on the heels of a series of poor harvests, its impact worsened by endemic peasant poverty and low productivity. The population of the affected areas had few reserves of food and faced the prospect of mass starvation. The provinces of Samara and Saratov were hit hard by the famine. It was reported that in Samara more than half of the population was destitute. Maps of the famine zone show that the area around Norka experienced total crop failure. ...in the winter of 1892 the mortality rate in the Volga German colonies was about five times the normal rate or 200 in 1,000... Persons who try to ameliorate the condition of the masses are suspected persons, and are lucky if they do not see the inside of a prison, or even Siberia. Source: "The Graphic" (January 9, 1892): 45. Reports by Rudolph Blankenberg, an American in charge of the relief efforts, describe grim scenes where many houses were closed, thatch roofs had been uncovered and fed to the stock, one-third of the horses were dead and sickness was everywhere in the Volga German colonies. 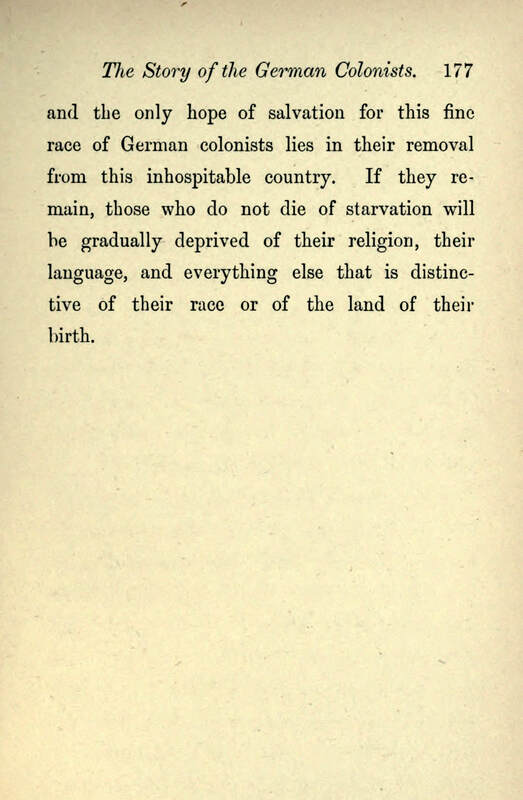 Brayley Hodgetts provides first hand reports about the conditions in the German colonies in his book titled "In the Track of the Russian Famine". Hodgetts states that Russian government was in the process of removing all of the privileges originally granted to the colonists by Catherine's Manifesto of 1763 and had virtually abandoned the German settlements during the famine. The United States responded to the crisis by forming the Russian Famine Relief Committee of the United States. Help poured in from the western states in which Russian Germans had settled in large numbers. Relief supplies from the United States filled an important role in saving lives. Many Volga Germans dreamed of escaping Russia and immigrating to America. Hundreds of friends and family were already in the "land of plenty" where the relief had come from. Letters from those already in America were positive about life there. Pre-paid tickets arrived from America as sharp competition between the steamship companies and railroads drove down fares. A passenger could travel from a seaport on the east coast to Lincoln by rail for $8.00. As a result of these conditions, many people from Norka immigrated to the United States between 1890 and 1893. Blankenburg, Rudolph. Philadelphia and the Russian Famine of 1891 and 1892: Letters from Russia to the Philadelphia "Ledger", "Times" and "Inquirer." Philadelphia: Russian Famine Relief Committee, 1892. Print. Hodgetts, Edward Arthur Brayley. "The Story of the German Colonists." In the Track of the Russian Famine. London: T. Fischer Unwin, 1892. 159-77. Print. Lilly, David P. The Russian Famine of 1891-92. Loyola University, 1995. Web. 29 Nov. 2014. <http://www.loyno.edu/~history/journal/1994-5/Lilly.htm>. Reeves, Francis Brewster. Russia Then and Now: 1892-1917 ; My Mission to Russia during the Famine of 1891-92. New York: Knickerbocker, 1917. Print. <https://books.google.com/books?id=bHdBAAAAIAAJ>. Robbins, Richard G. Famine in Russia: 1891-1892 ; the Imperial Government Responds to a Crisis. New York: Columbia U Pr., 1975. Print. <https://books.google.com/books?id=ijY_i3QMkE4C>. Stadling, Jonas. 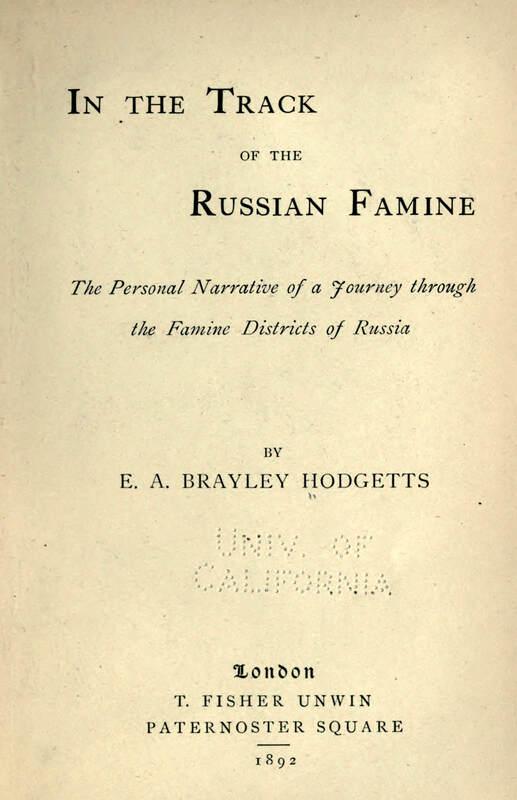 "The Famine in Russia." The Century 46.4 (Aug 1893). Print. Stadling, Jonas Jonsson, and Will Reason. In the Land of Tolstoi; Experiences of Famine and Misrule in Russia. New York: T. Whittaker, 1897. Print. <https://books.google.com/books?id=PiAEAAAAYAAJ&>. "Starving on the Volga." New York Times 8 Mar. 1892. Print. Last updated March 31, 2018.